Rrecoverable reserves in Gina Krog total 16.8 million m3 of oil, 11.8 billion m3 of gas and 3.2 million t of natural gas liquids. 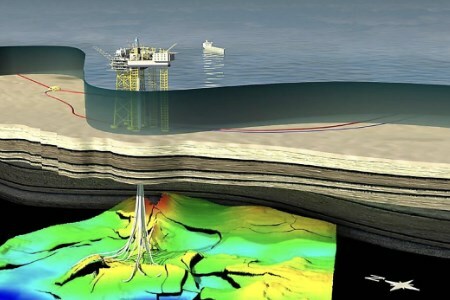 The field was developed with a production facility resting on the seabed and an oil storage ship at a water depth of 110 - 120 m. The oil is exported via buoy loaders, and the gas is sent to the Sleipner A platform for final processing. Gas for injection is imported from Zeepipe 2A (Gassled). "Statoil brings Gina Krog on stream"
This means that three out of four fields on or near the Utsira High are now producing. Edvard Grieg started in November 2015, while Ivar Aasen followed in December of last year. Johan Sverdrup is expected to start producing in late 2019. “Gina Krog is an important contribution towards maintaining a high level of profitable production from the shelf,” says Tove Francke, the Norwegian Petroleum Directorate’s Assistant Director for the Southern North Sea. Gina Krog has been prepared for phasing in current and future discoveries in the area, and will be tied in to a planned joint solution to supply the Utsira High with power from shore. This will be in place in 2022.